Remember to respect the culture and bring appropriate clothing that covers your shoulders and the majority of your legs. (Speaking from a womans POV) Don't wear skimpy clothing. If you plan to visit any mosques, remember to bring a light scarf to cover your head/ hair. In the majority of Medinas and larger cities, women still wear veils and the street is mostly the man's domain. Different women have different experiences with sexual harassment in Morocco. Some find it persistent and bothersome, while others have little or no trouble with it. Obvious way to get rid of unwanted attention is the same you would do here at home: appear confident and assured. Again, attire is another strategy for avoid unwanted attention. Do not buy the dried fruit in Jemaa el-Fnaa matter how delicious they may looks. The water they use to spray the fruit to make it look delicious is generally contaminated and people have gotten sick from it. ONLY drink bottled water, do not drink from the tap. Even when brushing your teeth, use bottled water. Its a lot easier to handle and way easier to negotiate with. Highly suggest staying in a Riad in Marrakech. If you are an argan oil user, buy it in Morocco. If you have the time, find a woman's cooperative and watch the amount of work that goes into cultivating the product. Plus, supporting the local women empowerment movement is a wonderful feeling on its own! Moroccan tea is a must! It can be a little sweet but it is delicious. Morocco Currency is the Dirham, MAD. I must say, after a week in this zen paradise, I didn't want to come back to the craziness of NYC. The feeling of absolutely serenity does stay with you for a while after returning home which is amazing and I can't wait to find another yoga surf trip in a new destination! Beach, Surf, Yoga...Repeat x 7. Surf Maroc was quite an amazing experience and as a New Yorker, it took at least three days to completely detox from the sounds and hustle of life and learn to appreciate the serenity of the retreat. Morning yoga started at 7am for about 1.5 hours and then off to a family style breakfast in the garden patio. Yoga is always held in a beautiful indoor and outdoor Shala that allows for a delightful breeze during your practice. Yoga is for both beginners through advanced and there is no need to know any yoga prior to attending. We practiced Vinyasa as well as Yin and Yang Yoga and I learned that Savasana is incredibly difficult! Not only must you remain awake and calm, but you must put your mind at ease and not move a single inch. Everyone moves at their own speed and our instructors Tara and Jennifer were absolutely phenomenal. I even made my way halfway up to a headstand! (I'm so proud I had to include a photo below!) As for surfing, they provide the surfboards, instructors and wetsuits and again, no need for prior knowledge of surfing. You are broken up into different groups based upon previous surf experience and the instructors usually had no more than 3 or 4 students at a time. I got up on the board and pat myself on the back for surfing a handful of waves. Paddling out is the toughest part and makes for super sore muscles. Thank goodness for Yin and Yang yoga in the evenings to stretch out our bodies! We are given about 3-4 hours on the beach each day in which you can choose to surf, read, play around in the water or simply just soak in the sun. Camels can be rented with a guide for less than $15USD for two hours. The camels will walk along the beach and the guide will tell you history of the area you are in and tell stories of fisherman stories at sea and happily take your photo! If you're going during the day, make sure to wear a lot of sunscreen and a hat as the sun can be brutal and the camels walk really slow. We took a taxi from Agadir to Marrakech and it was about a 3 hour drive. Arriving in Marrakech is a little hectic. They park outside the main Medina near the Jemaa el-Fnaa, which is the main square and marketplace. Walk deeper in the marketplace and you will find narrow alleyways filled with stalls leading to many other souks. During the day, the square is predominantly occupied with orange juice stalls, ladies drawing henna designs, snake charmers and young apes doing tricks. As nightfalls, the crowd changes to dancing boys, story-tellers, magicians and fortunetellers. Around dinner time, the square fills with food stalls including kabobs all of types, all kinds of seafood, desserts, anything you could ever want to eat. Inside the souk, get ready for sensory overload! You will find thousands of stalls selling everything from handwoven baskets and spices to perfumes and oils to rug and silver items. You WILL want to buy everything! Popular items are rugs, hand carved chests, mirrors, baskets, poufs and lanterns, and they are all so beautiful. Leather and silver goods are a commodity here so you will find plenty of stalls selling similar items. Remember to negotiate hard. If you look like a tourist, get ready to have their initial offer be triple what they will end up settling for. And if they don't settle, don't worry. You will find about 20 other stalls selling the exact same thing. I promise your negotiation skills will really be put to the test here. We stayed one night at the Riad Itrane, which I highly suggest. The guest rooms are really authentic like a beautifully decorated Moroccan home. Plus, the Riad Itrane is only a two minute walk from the center of Jemaa el-Fnaa, so you can easily walk back to your room if you wish to drop off purchases and rest. There are very few ATM's around so make sure you go to the bank before heading into Jemaa el-Fnaa. Notice anything about this photo? Everyone sitting here is a man! The enchanting Jardin Majorelle is one of the most visited places in Marrakech, and for good reason. It took the French painter Jacques Majorelle 40 years to bring this garden to life. In 1980, Yves Saint Laurent and Pierre Berge bought the Jardin Majorelle and saved it from falling victim to a real estate project which would turn it into a hotel complex. After passing away in 2008, Yves Saint Laurent's ashes were scattered in the rose garden and a memorial was built. The garden is full of shady trees, exotic plants and refreshing burbling streams of water. Its a lovely way to spend an afternoon in Marrakech. If you watch Game of Thrones on HBO, you will recognize Essaouira immediately and if you don't watch Game of Thrones then you are missing out! 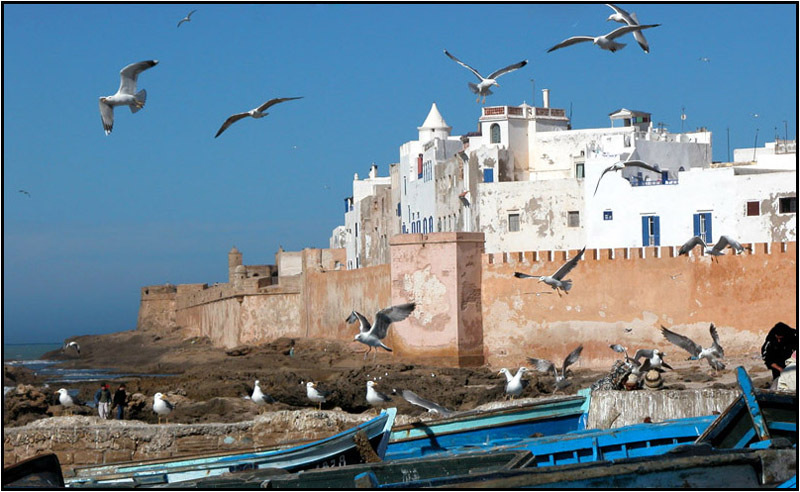 Essaouira is a small seaside town with fortified walls, a fishing harbour and seagulls soaring all around. Similar to Marrakech, there are plenty of souks and stalls selling all types of items, but it isn't nearly as crowded. The prices seemed a little more flexible here and there was much more room for negotiation. I negotiated a rug for about $15USD and thought I would probably find a better deal, so I held off and found out it was almost $100USD in Marrakech. I still think about that little beach rug to this day... The fishing stalls right outside the walls of Essaouira are lined with fishermen and their catches of the day. There are plenty of grills in which they will happily grill up for you to eat, as very low cost. Britt and I decided to get henna while in Essaouira thinking it would be less expensive than in Marrakech. It basically washed off the next day. (I think we got someone who didn't really know how to do it.) Advice, just skip over the henna, however it does make for a good photo! All in all, the gentle coast breeze and delicious food makes Essaouira a must visit destination. So, if you're considering a yoga and or surf retreat, highly consider doing one with Surf Maroc in Morocco. You will meet people from all over the world and push you to explore emotional places that you didn't even knew existed. In a non stop city like New York, it really should be a requirement for people to get out and take a mental break and what better way than a rejuvenating yoga and surf retreat. I'd love to hear if any of you have ever been on a great wellness retreat! Share in the comments below.